Tarts | Courses | ohdenny. I saw this amazing recipe from Chew Town that I was salivating. 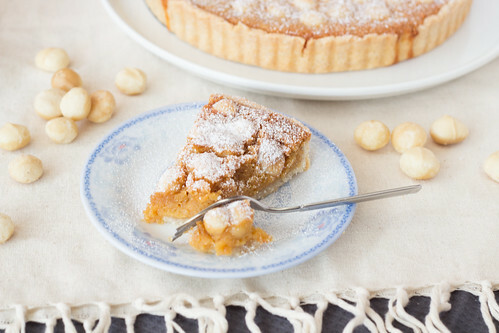 It has a lovely golden syrup flavour with coconut and zesty lemon, a nice coconut flavoured tart base, and toasty macadamias. The perfect combination. 1. 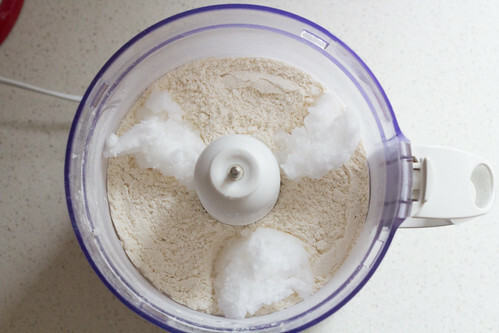 Place the plain flour, desiccated coconut, and salt in a food processor. Pulse until well combined. 2. 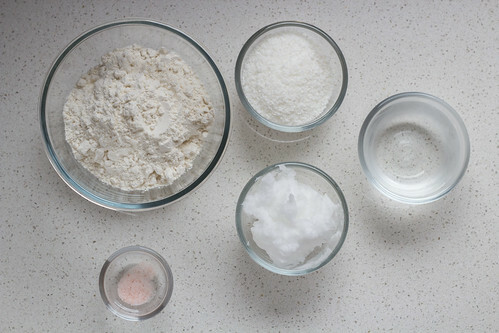 Add the coconut oil, and then pulse until the mixture is crumbly and sand-like. 3. 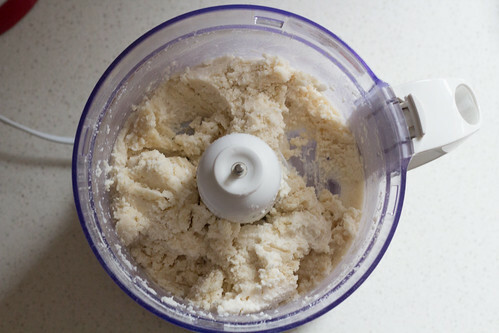 Add water while the food processor is pulsing, until the dough comes together. Note: You may not need all the water. 4. 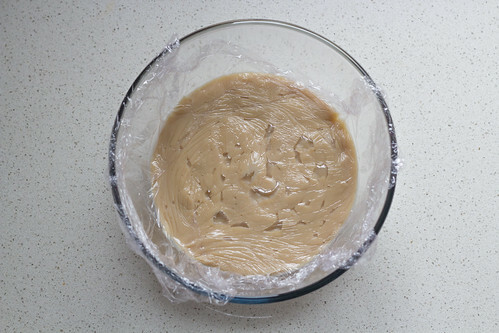 Remove the dough from the food processor and wrap it with cling wrap, and place in the fridge for an hour to chill. 5. 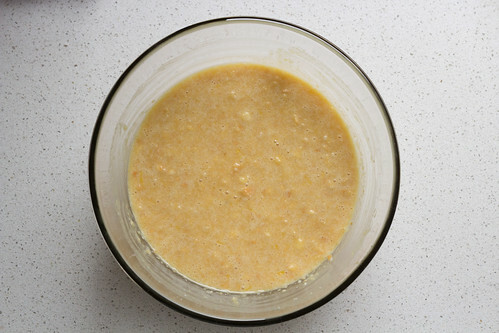 In a medium sized bowl, mix the egg and thickened cream until just combined. 6. Add in the golden syrup, macadamia meal, breadcrumbs, lemon zest and lemon juice to the mixture. Whisk until all combined and then cover with cling wrap and refrigerate. 7. Preheat oven to 180°C. 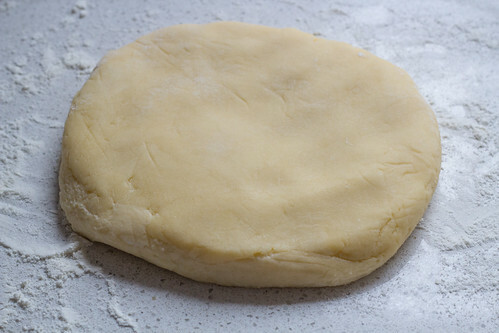 Remove the pastry from the fridge and allow to soften for around 5 to 10 minutes. 8. 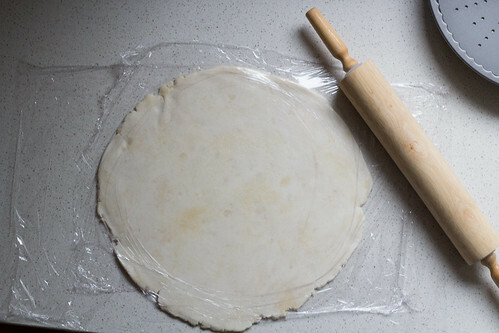 Place cling wrap beneath and on top of the pastry and roll out the pastry until it is wide enough to line the base and sides of the tart tin. 9. 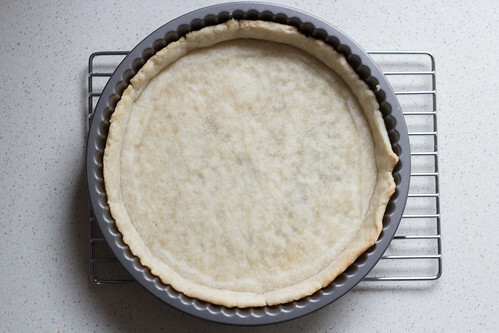 Place the pastry into the tart tin and mould the dough to fit the tin. Prick the base with a fork and then place the pastry in the fridge to chill for around 30 minutes before baking. 10. Line the dough with baking paper and then add in ceramic baking weights (or rice) and blind bake for 20 minutes. 11. Remove the weights and baking paper, then bake the base for an additional 5 minutes. Remove the case from the oven to cool to room temperature. 12. Decrease the oven to 160°C. Remove the filling from the fridge and pour filling into the cooled base. 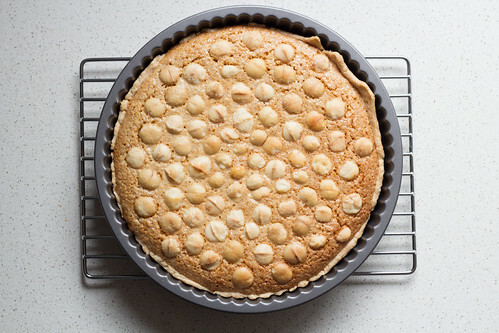 Place the macadamias on top of the filling, then place in the oven and bake for around 40 minutes or until the filling is just set and the macadamias are golden. Remove from the oven and allow to cool before removing from the tart tin. 13. 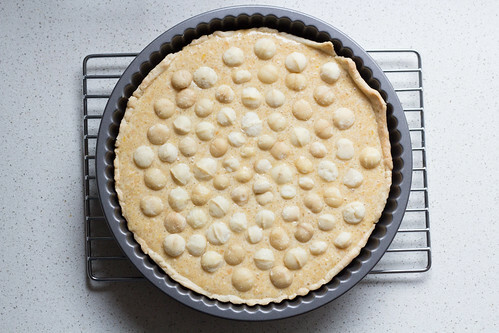 Remove the cooled tart from the tin, and dust with icing sugar before serving. 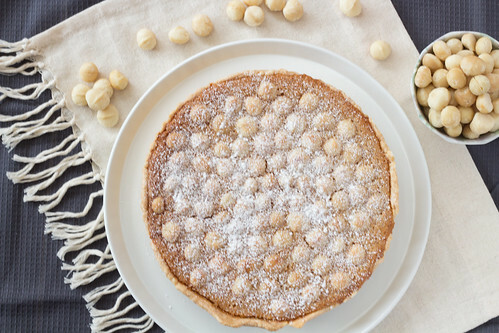 A deliciously moist macadamia, coconut and golden syrup tart. 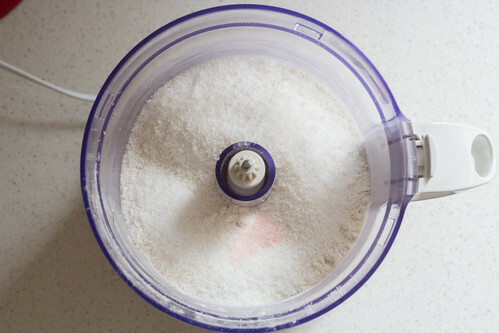 Place the plain flour, desiccated coconut, and salt in a food processor. Pulse until well combined. Add the coconut oil, and then pulse until the mixture is crumbly and sand-like. 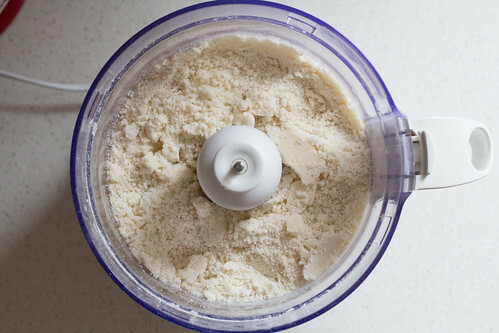 Add water while the food processor is pulsing, until the dough comes together. Note: You may not need all the water. 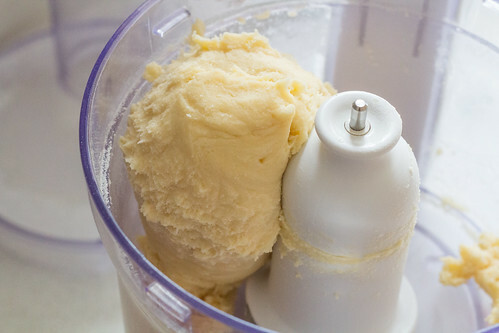 Remove the dough from the food processor and wrap it with cling wrap, and place in the fridge for an hour to chill. 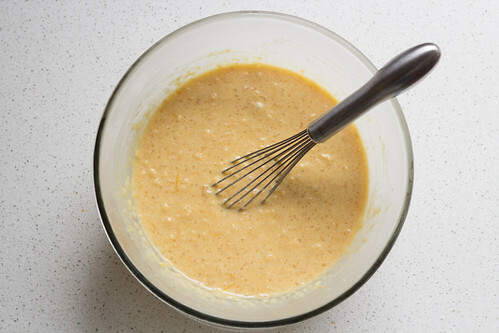 In a medium sized bowl, mix the egg and thickened cream until just combined. 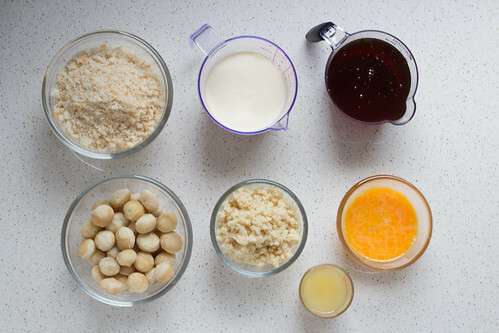 Add in the golden syrup, macadamia meal, breadcrumbs, lemon zest and lemon juice to the mixture. Whisk until all combined and then cover with cling wrap and refrigerate. Preheat oven to 180°C. 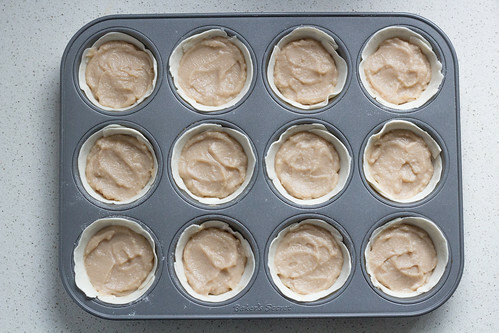 Remove the pastry from the fridge and allow to soften for around 5 to 10 minutes. 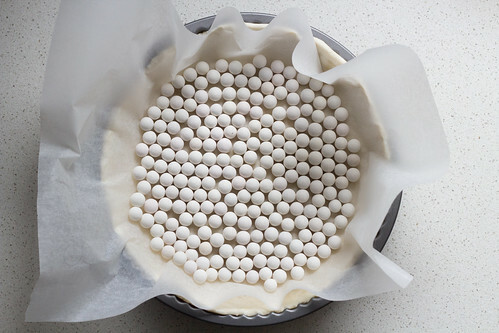 Place cling wrap beneath and on top of the pastry and roll out the pastry until it is wide enough to line the base and sides of the tart tin. 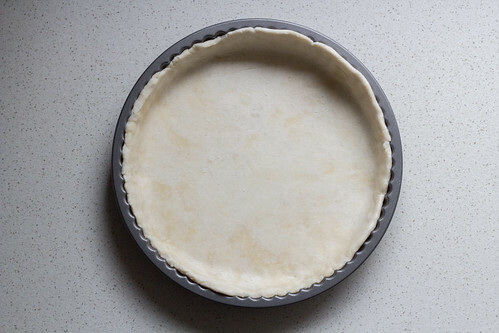 Place the pastry into the tart tin and mould the dough to fit the tin. Prick the base with a fork and then place the pastry in the fridge to chill for around 30 minutes before baking. Line the dough with baking paper and then add in ceramic baking weights (or rice) and blind bake for 20 minutes. Remove the weights and baking paper, then bake the base for an additional 5 minutes. Remove the case from the oven to cool to room temperature. Decrease the oven to 160°C. Remove the filling from the fridge and pour filling into the cooled base. 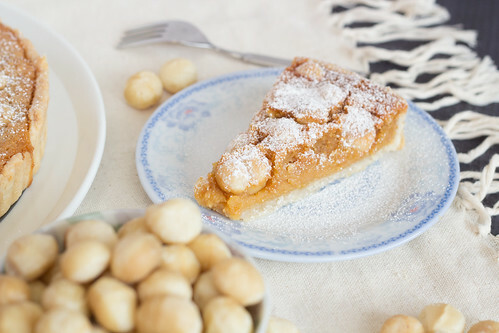 Place the macadamias on top of the filling, then place in the oven and bake for around 40 minutes or until the filling is just set and the macadamias are golden. Remove from the oven and allow to cool before removing from the tart tin. Remove the cooled tart from the tin, and dust with icing sugar before serving. Instead of dusting with icing sugar, drizzle golden syrup before serving for some added sweetness and golden syrup flavour. I love making desserts that aren’t traditional and pairing Asian flavours with Western desserts. 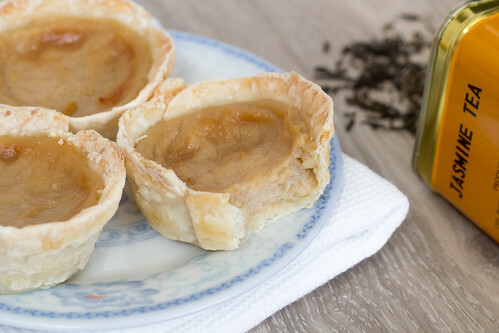 I really wanted to try infusing tea flavours into a Portuguese Egg Tart and couldn’t find any recipes on how to do it. So I had to think on how I would normally infuse a milk mixture with tea. 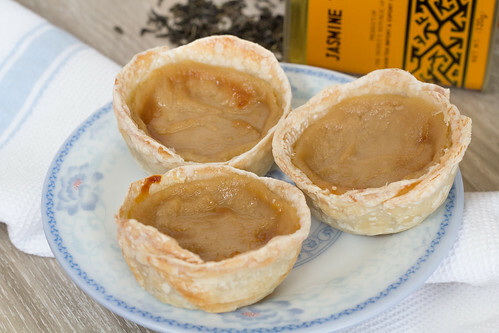 Found a nice Portuguese Egg Tart recipe from Not Quite Nigella that I tweaked a bit with the addition of the jasmine tea. The end result was quite good, the Jasmine Tea flavour is subtle yet distinct as Jasmine Tea can be quite intense and overpowering but here it worked really well actually! 1. 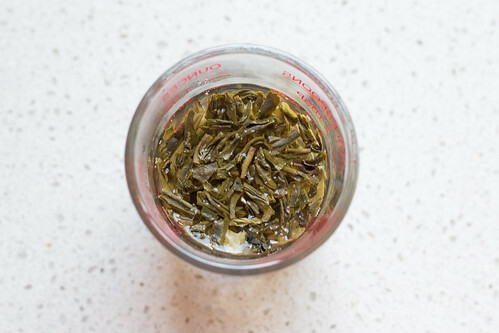 In a heatproof cup or bowl, pour in the hot/boiling water and then add in the jasmine tea leaves to steep for around 10 minutes. 2. 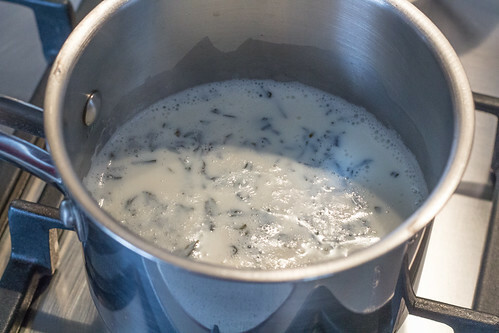 Combine the milk and jasmine mixture in a saucespan and heat over medium heat and bring to the boil. Turn off the heat, cover the saucespan and allow the mixture to cool and steep further for around 20 minutes. 3. 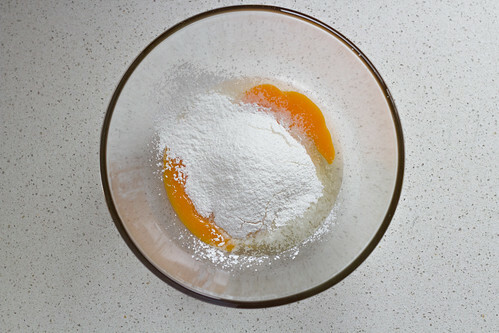 Place the eggs, egg yolks, sugar and sifted cornflour into a medium sized bowl and whisk together until smooth. 4. 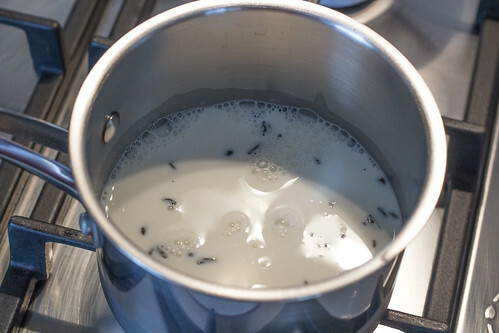 Strain the jasmine milk mixture and using a spoon to press against the tea leaves to extract more flavour from the leaves. 5. 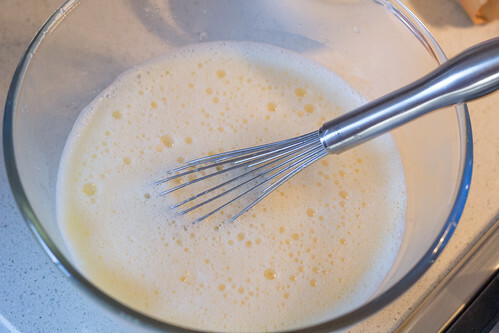 Gradually add in the milk mixture to the egg mixture and whisk until smooth. 6. Pour the mixture in a saucespan and cook over medium heat, stirring occasionally so that the the bottom of the mixture doesn’t overcook, until the mixture thickens and comes to the boil. Do not over stir as that can cause the custard to split. Remove from the heat. 7. Add in the vanilla extract and stir until combined. 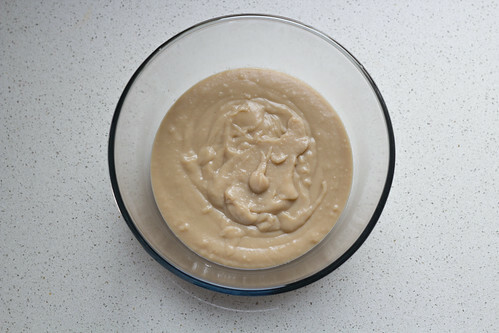 Transfer the mixture to a bowl and cover the surface of the custard with cling wrap as a skin will form if this is not done. Leave to cool. 8. 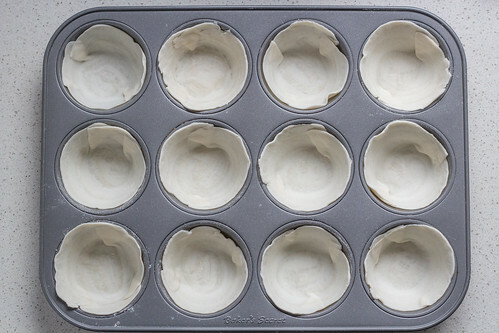 Grease a 12-hole 80ml muffin tray and preheat the oven to 200°C. 9. 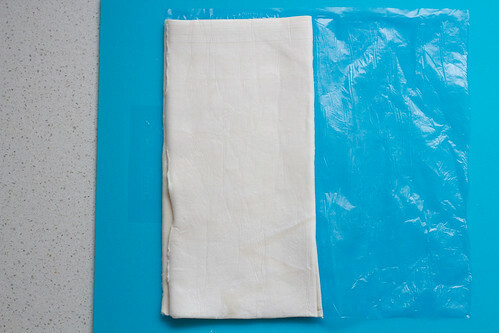 Cut the pastry sheet in half, and the place one half of the sheet on top of the other and set aside for 5 minutes. 10. 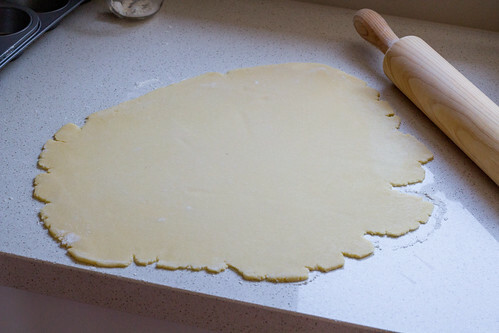 Roll the pastry tightly from the short end and then cut into 12 equal pieces. 11. Lightly flour the surface and roll out each until each is 10cm in diameter and then place the pastry sheets into the greased muffin tray. 12. 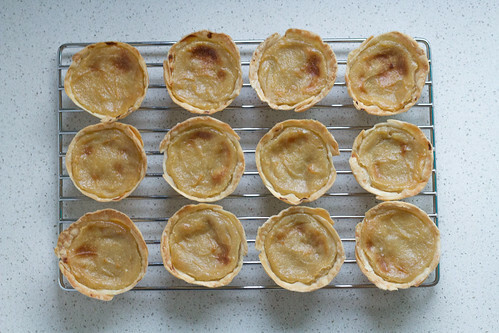 Remove the cling wrap from the cooled custard and spoon the mixture into the pastry tarts. 13. Place the muffin tray into the oven for around 20 to 25 minutes or until the pastry and custard are golden. 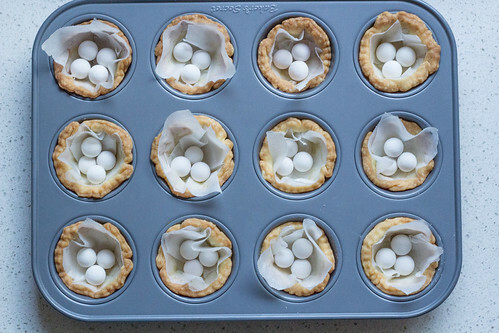 Leave the tarts in the tray for 5 minutes before transferring to a wire rack to cool completely. 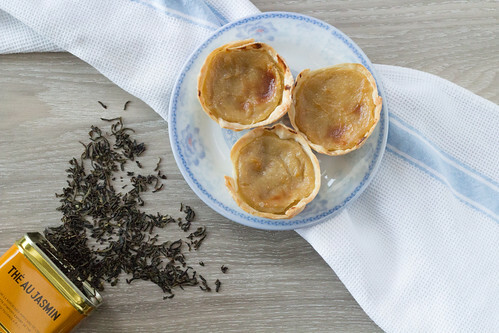 A little twist to the traditional Portuguese Egg Tarts. In a heatproof cup or bowl, pour in the hot/boiling water and then add in the jasmine tea leaves to steep for around 10 minutes. 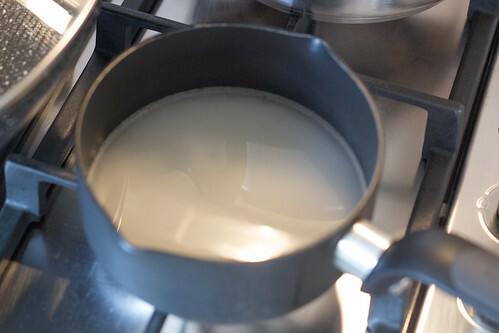 Combine the milk and jasmine mixture in a saucespan and heat over medium heat and bring to the boil. Turn off the heat, cover the saucespan and allow the mixture to cool and steep further for around 20 minutes. 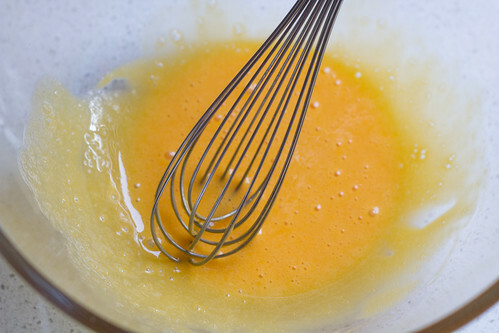 Place the eggs, egg yolks, sugar and sifted cornflour into a medium sized bowl and whisk together until smooth. 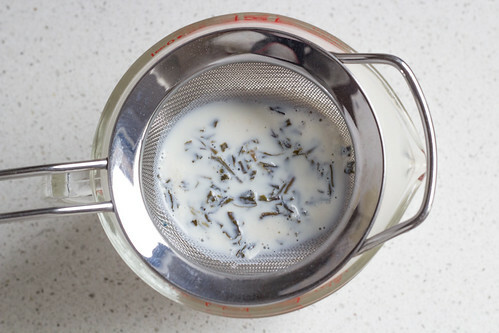 Strain the jasmine milk mixture and using a spoon to press against the tea leaves to extract more flavour from the leaves. 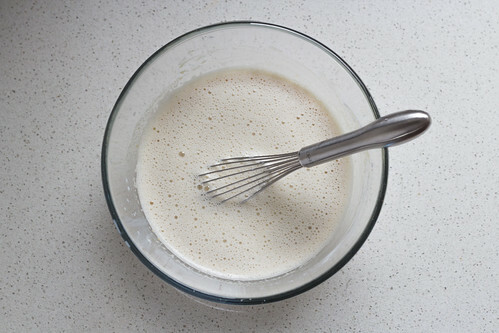 Gradually add in the milk mixture to the egg mixture and whisk until smooth. Pour the mixture in a saucespan and cook over medium heat, stirring occasionally so that the the bottom of the mixture doesn't overcook, until the mixture thickens and comes to the boil. Do not over stir as that can cause the custard to split. Remove from the heat. Add in the vanilla extract and stir until combined. 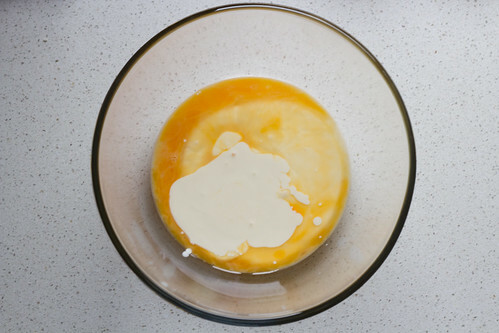 Transfer the mixture to a bowl and cover the surface of the custard with cling wrap as a skin will form if this is not done. Leave to cool. Grease a 12-hole 80ml muffin tray and preheat the oven to 200°C. 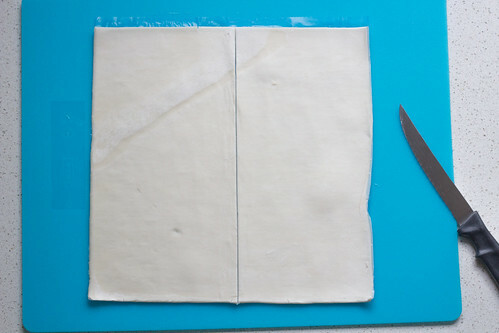 Cut the pastry sheet in half, and the place one half of the sheet on top of the other and set aside for 5 minutes. 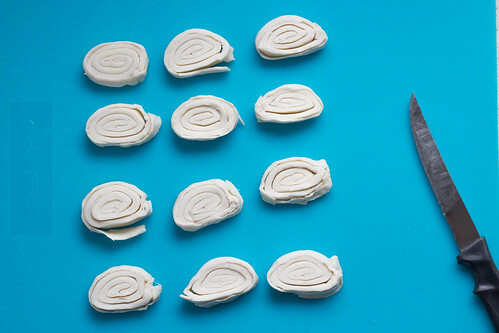 Roll the pastry tightly from the short end and then cut into 12 equal pieces. 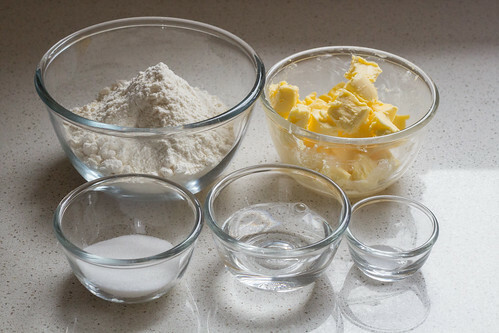 Lightly flour the surface and roll out each until each is 10cm in diameter and then place the pastry sheets into the greased muffin tray. Remove the cling wrap from the cooled custard and spoon the mixture into the pastry tarts. Place the muffin tray into the oven for around 20 to 25 minutes or until the pastry and custard are golden. 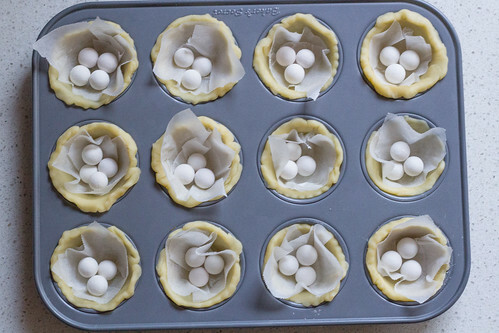 Leave the tarts in the tray for 5 minutes before transferring to a wire rack to cool completely. You can use any other tea leaves you like! To make the original Portuguese tarts, add in another 1 tsp of vanilla extract and start from step 3, and skipping step 4. 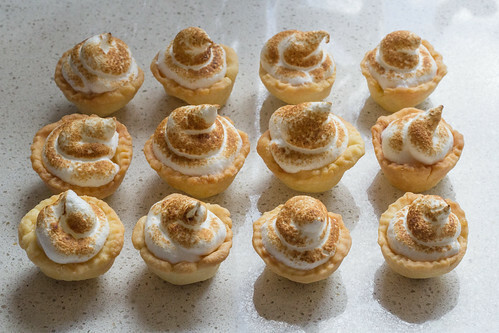 These little Lemon Meringue Tarts are so adorable and bite sized, so it’s great to serve at parties. This recipe from A Table For Two (Billy Law) uses Meyer Lemons which I believe are sweeter, but fret not, your common supermarket lemons can also be used! 1. 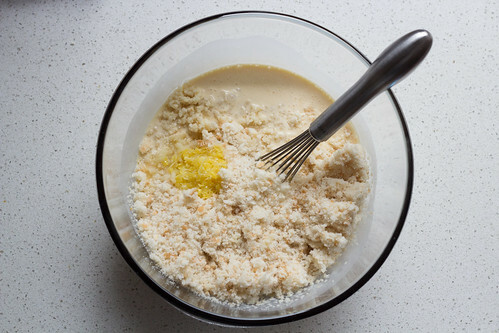 To make the pastry, put all the ingredients, except the water, into a food processor and pulse until it resembles breadcrumbs. 2. Slowly pour water in a steady stream while still pulsing, until it comes together and forms a rough dough. 3. 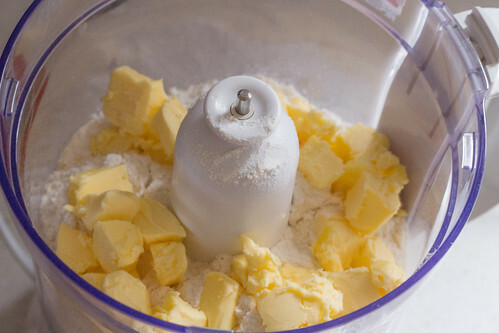 Place the dough out onto a floured surface and gently gather all loose crumbs together to form a smooth firm dough. 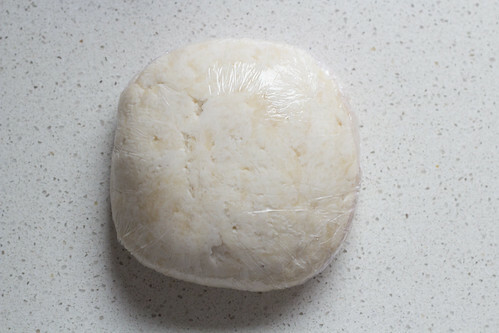 Flatten the dough into an inch thick , wrap in plastic wrap and place in the refrigerator for at least 1 hour. 4. 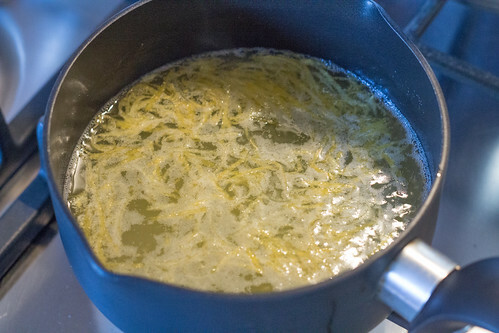 To make the lemon curd, add lemon zest, juice and sugar in a medium saucepan and heat over medium high heat to the boiling point and sugar has dissolved, then remove from heat. 5. 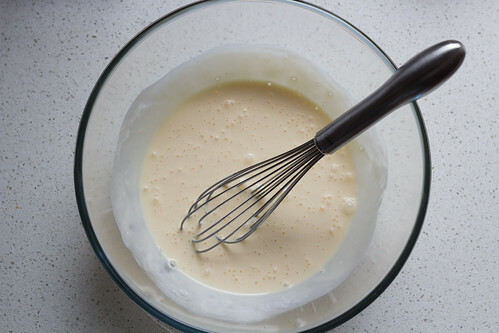 Whisk yolk together in a mixing bowl, then slowly pour the hot mixture in a stream into the yolk while keep whisking until combined. 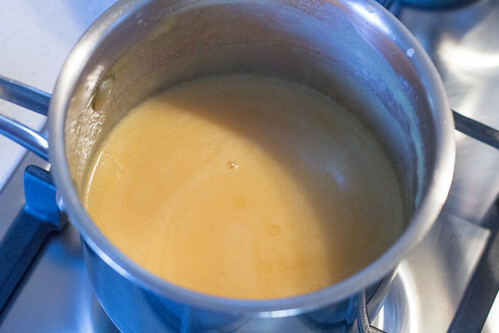 Add the heavy cream to the mixture, stir and then pour it back into the saucepan. 6. Place saucepan over medium heat, keep stirring with a wooden spoon until the mixture thickens, it will take about 15 minutes. 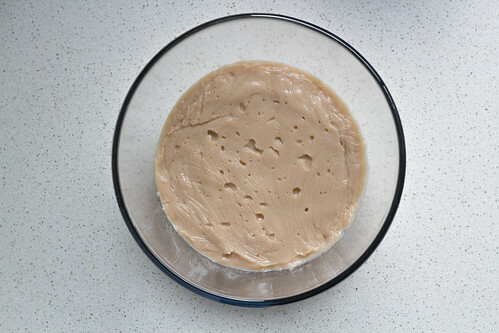 Test it by coating the back of the wooden spoon with the curd, and draw a line with your finger, if the line stays clean then the curd is thick enough and is ready. 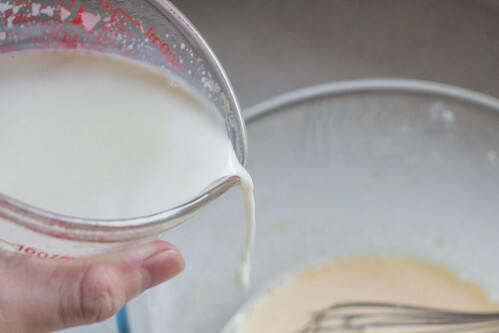 Pour the curd into a bowl and let it cool completely. Wrap in plastic wrap and transfer to refrigerator until ready to be used. 7. 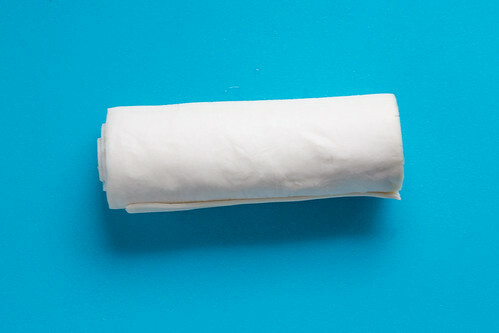 Roll the chilled pastry on a floured surface to about 2mm thick. 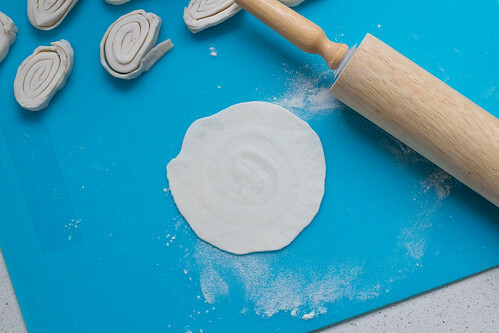 Use a 3-inch ring cutter, cut dough into small round discs then line the tin, press down firmly with fingers. Place the tin in the refrigerator for 20 minutes and pre heat oven to 200°C. 8. Blind bake the tart cases for 15-20 minutes. 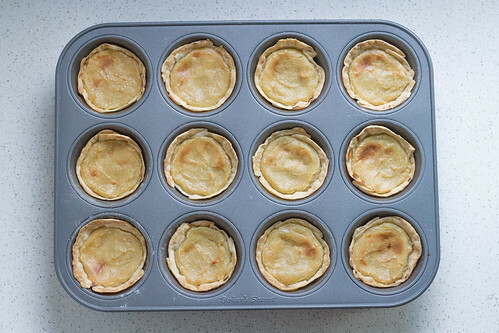 Once cool enough to handle, remove tart cases from the tin and let it rest on a wire rack. 9. 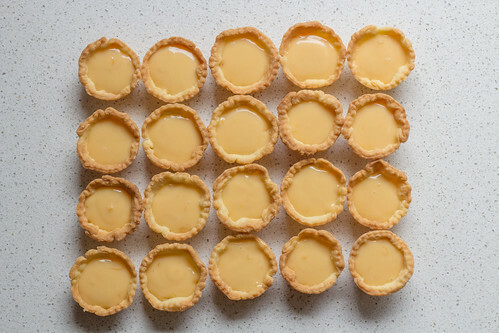 Fill a piping bag with lemon curd, then pipe into each tart case and let it set in the refrigerator. 10. To make the meringue, add sugar and water in a small saucepan and bring to boil over medium-high heat. Use a thermometer to measure the temperature of the sugar syrup and have the egg white inside the bowl of an electric stand mixer on standby. 11. 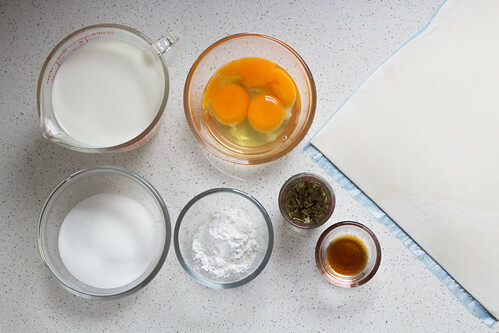 Once the temperature of the sugar syrup reaches 115°C, start whisking the egg whites on medium speed until soft peaks. 12. 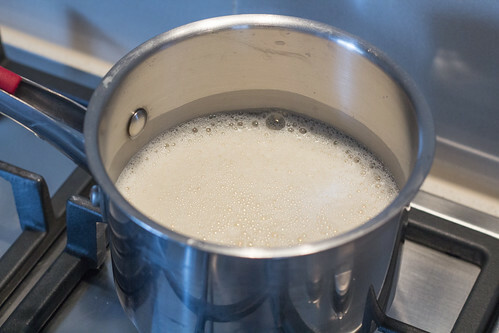 When the sugar syrup reaches 121°C, remove from heat and let the boiling bubbles settle a little bit, then gently and slowly pour the hot sugar syrup down the side of the mixing bowl into the egg white. Make sure the sugar syrup doesn’t catch on the whisk and crystallised. 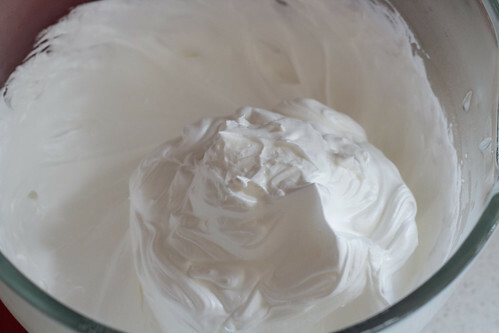 Keep whisking the meringue until the bowl is cool to touch and the meringue is now smooth, satiny and glossy. Fill a piping bag with the meringue. 13. Pipe the meringue onto the top of the lemon curd until it is completely covered. 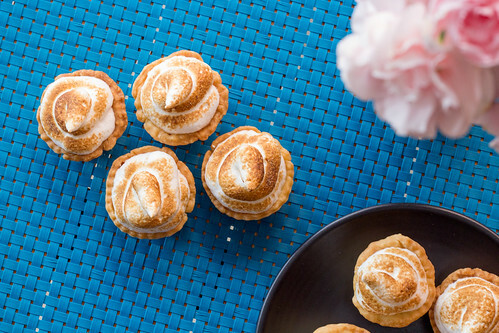 Use a kitchen blowtorch to light scorch the meringue all over. 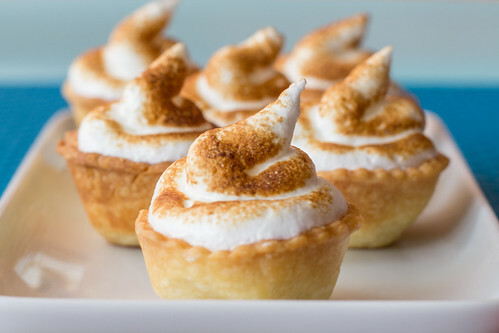 Tangy lemon tarts with a toasty meringue top! 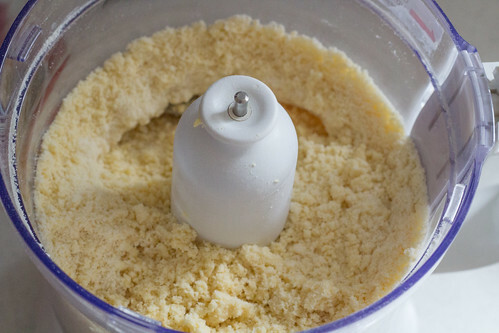 To make the pastry, put all the ingredients, except the water, into a food processor and pulse until it resembles breadcrumbs. Slowly pour water in a steady stream while still pulsing, until it comes together and forms a rough dough. 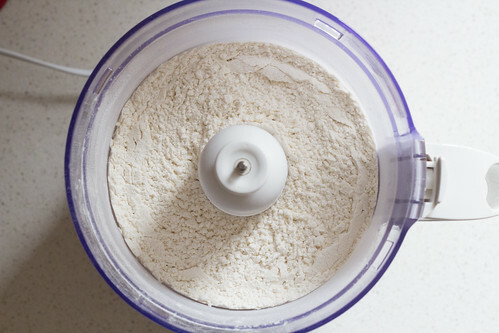 Place the dough out onto a floured surface and gently gather all loose crumbs together to form a smooth firm dough. 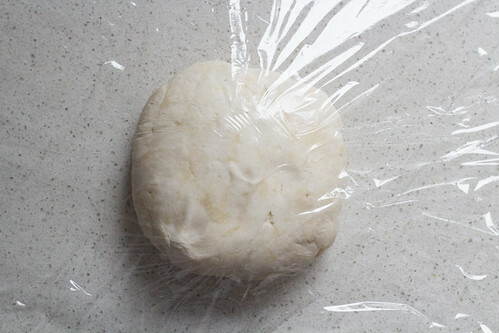 Flatten the dough into an inch thick , wrap in plastic wrap and place in the refrigerator for at least 1 hour. 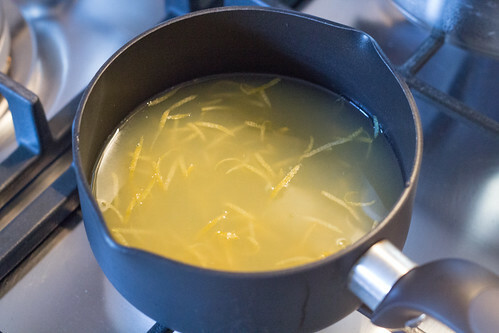 To make the lemon curd, add lemon zest, juice and sugar in a medium saucepan and heat over medium high heat to the boiling point and sugar has dissolved, then remove from heat. 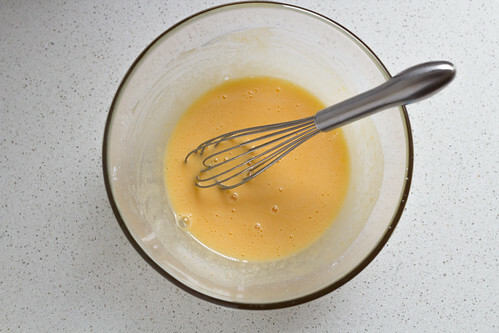 Whisk yolk together in a mixing bowl, then slowly pour the hot mixture in a stream into the yolk while keep whisking until combined. 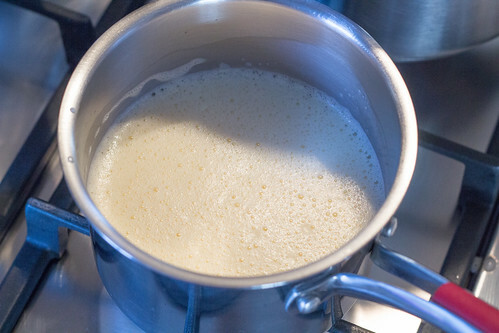 Add the heavy cream to the mixture, stir and then pour it back into the saucepan. 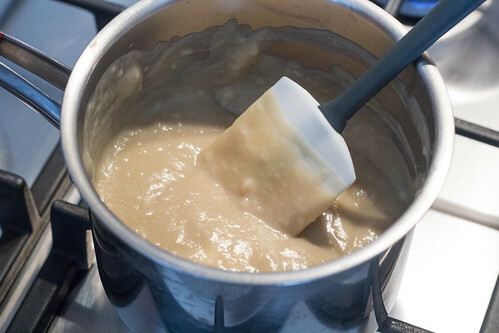 Place saucepan over medium heat, keep stirring with a wooden spoon until the mixture thickens, it will take about 15 minutes. 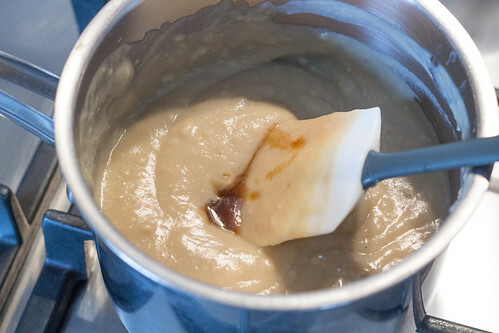 Test it by coating the back of the wooden spoon with the curd, and draw a line with your finger, if the line stays clean then the curd is thick enough and is ready. Pour the curd into a bowl and let it cool completely. Wrap in plastic wrap and transfer to refrigerator until ready to be used. Roll the chilled pastry on a floured surface to about 2mm thick. 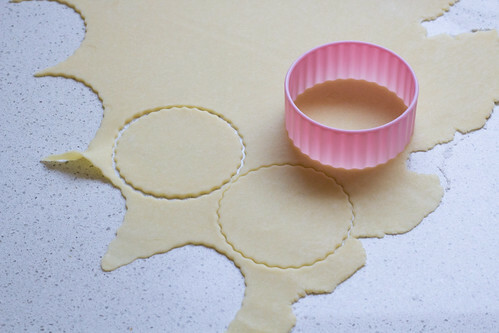 Use a 3-inch ring cutter, cut dough into small round discs then line the tin, press down firmly with fingers. 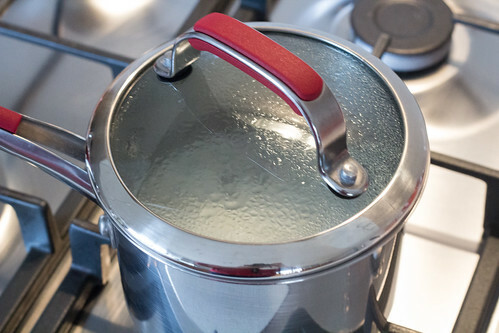 Place the tin in the refrigerator for 20 minutes and pre heat oven to 200°C. Blind bake the tart cases for 15-20 minutes. 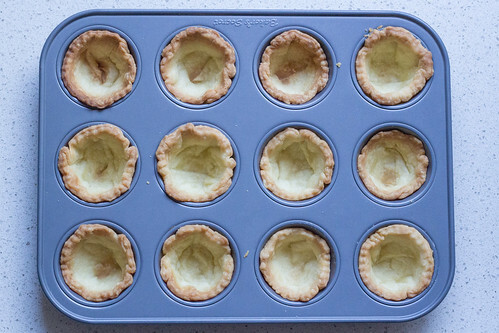 Once cool enough to handle, remove tart cases from the tin and let it rest on a wire rack. 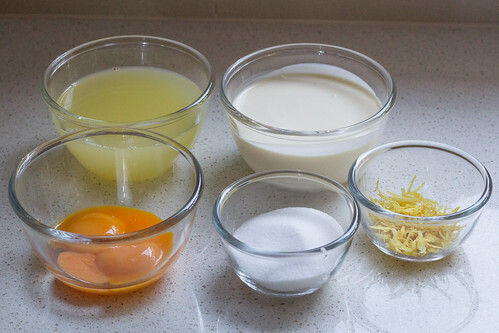 Fill a piping bag with lemon curd, then pipe into each tart case and let it set in the refrigerator. To make the meringue, add sugar and water in a small saucepan and bring to boil over medium-high heat. Use a thermometer to measure the temperature of the sugar syrup and have the egg white inside the bowl of an electric stand mixer on standby. 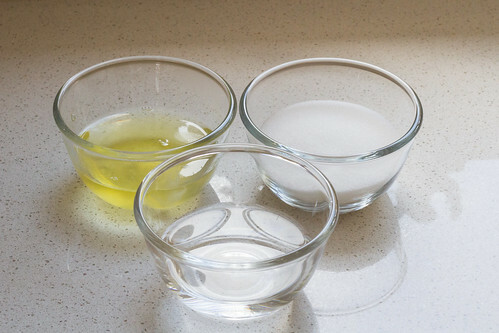 Once the temperature of the sugar syrup reaches 115°C, start whisking the egg whites on medium speed until soft peaks. 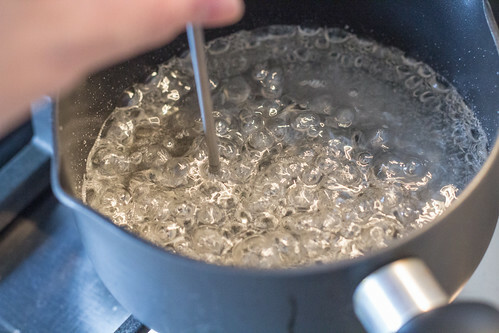 When the sugar syrup reaches 121°C, remove from heat and let the boiling bubbles settle a little bit, then gently and slowly pour the hot sugar syrup down the side of the mixing bowl into the egg white. Make sure the sugar syrup doesn’t catch on the whisk and crystallised. 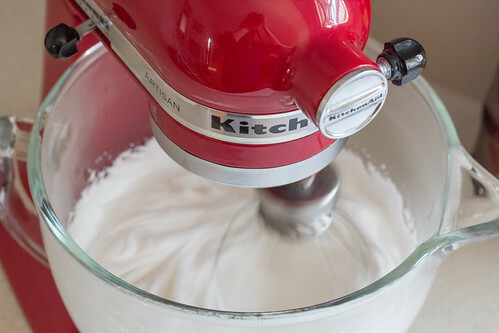 Keep whisking the meringue until the bowl is cool to touch and the meringue is now smooth, satiny and glossy. Fill a piping bag with the meringue. Pipe the meringue onto the top of the lemon curd until it is completely covered. 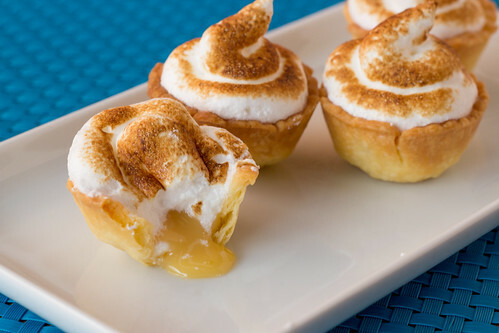 Use a kitchen blowtorch to light scorch the meringue all over. Meyer Lemons are recommended but if you have the more common lemons, 240ml makes it quite tangy. Reduce it to 180ml for a milder but still lemony curd. The lemon curd and tart cases can also be made a couple days in advance.